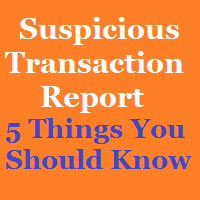 Home Topic of Week Suspicious Transaction Report or STR: 5 Things You Should Know ! Previous articleGetting A Statement of Perquisites & Profits in Lieu of Salary is Legal Right of Every Employee? The Word in the I.T.Act Not Found in Common Dictionary !